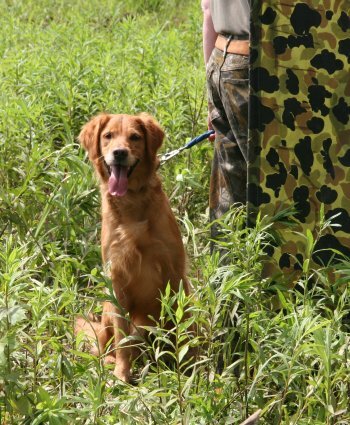 Fern Hill Golden Retrievers, beautiful top-quality field and working lines with great conformation, trainability, and dispositions. 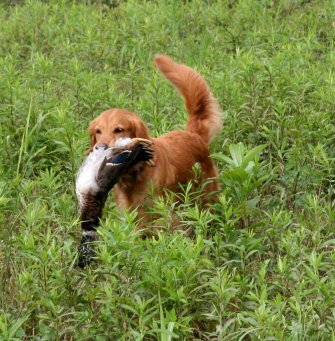 This picture was selected for October in the 2014 Browntrout Golden Retrievers Slimline Calentar. 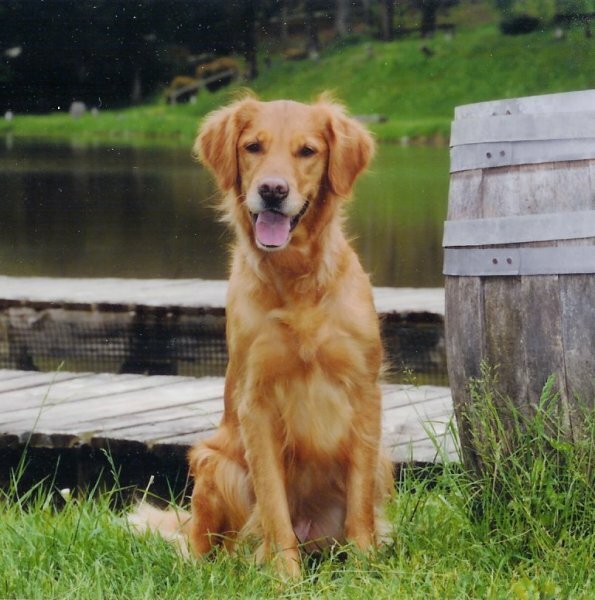 Penny was the 6th puppy from Hilfy's first litter, born May 28, 2005. 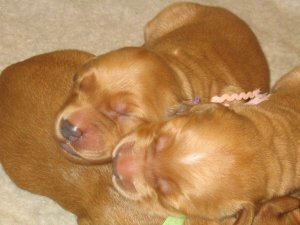 She was the puppy identified originally as "Lavender" because of her purple collar color. 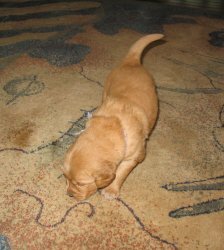 We chose the name "Pennyroyal" as her permanent name because it's a medicinal herb in the mint family useful for treating stress and anxiety, with small lavender or blue flowers -- so it seemed like a nice carryover from her puppy name plus expressed a bit about her place in our family. 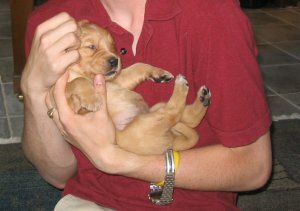 All of the puppies in that litter were wonderful, and it was a hard choice deciding which one to keep -- but we're pleased with our selection! 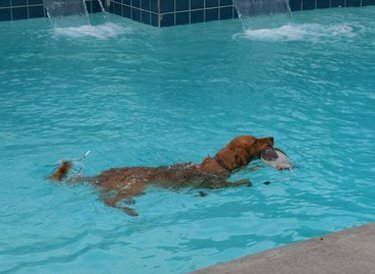 Penny is one of those dogs that is so smart, it's scary -- show her something once and she learns it. 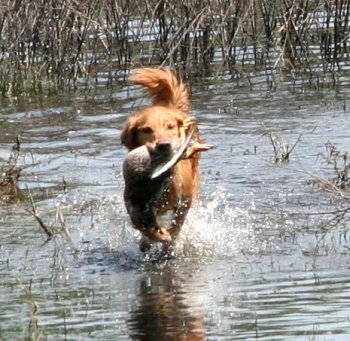 She has been a wonderful working competition dog for my husband -- his first dog so he doesn't know how unusual this is! For a complete list of her titles, see below. 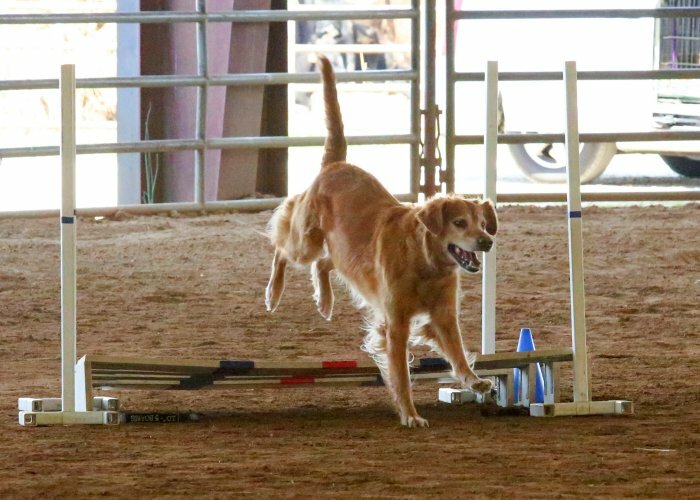 Penny finished her show career with a Novice Agility Preferred title in December 2013 at the age of 8 and a half. 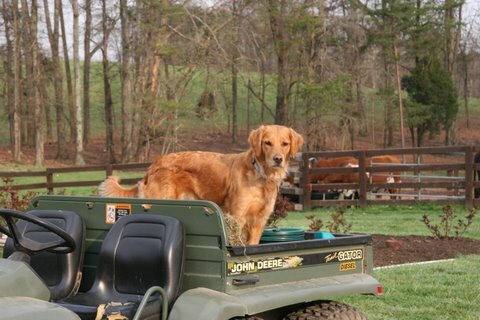 Penny had two litters for us totaling 18 puppies, and is the dam of our beautiful and stylish Panda. Penny picked up an infection on September 27, 2018, and it rapidly went system-wide. By the next afternoon, despite being on antibiotics, she was unable to walk and fading fast. Rather than taking the chance that IV antibiotics might cure her, and not wanting her to die alone in the hospital, we made the decision to put her to sleep that afternoon. 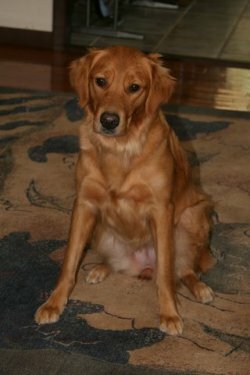 She was 13 years and 4 months old. 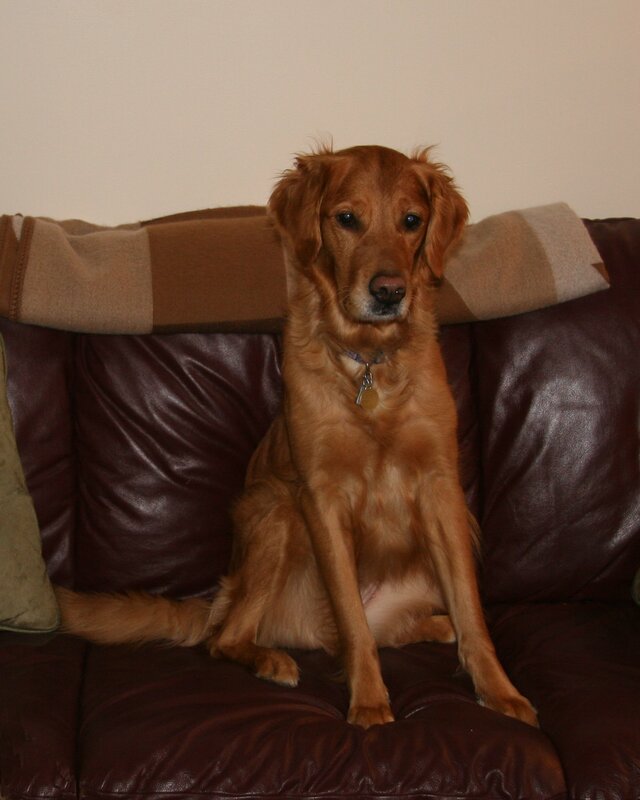 She is much missed by us all, human and canine alike. 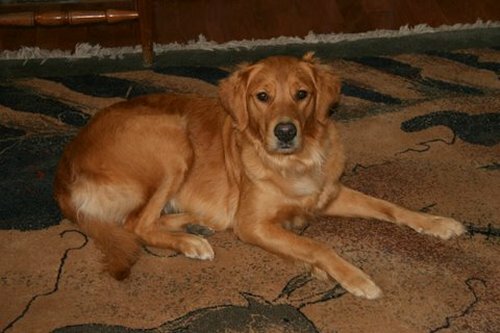 Penny on September 24, 2018, 4 days before her death. 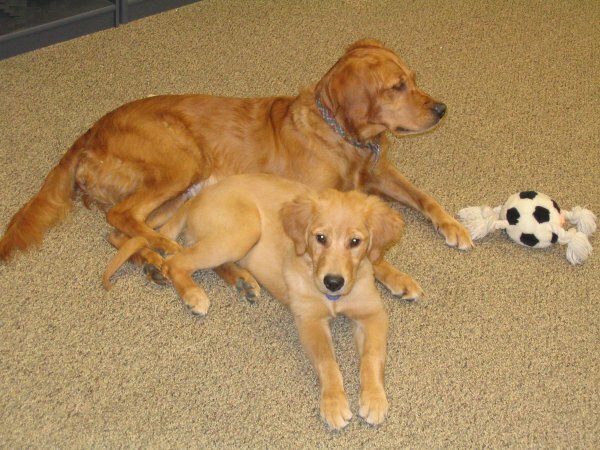 Penny had a serious bout with Rocky Mountain Spotted Fever from September 1, 2013 through the end of the year. 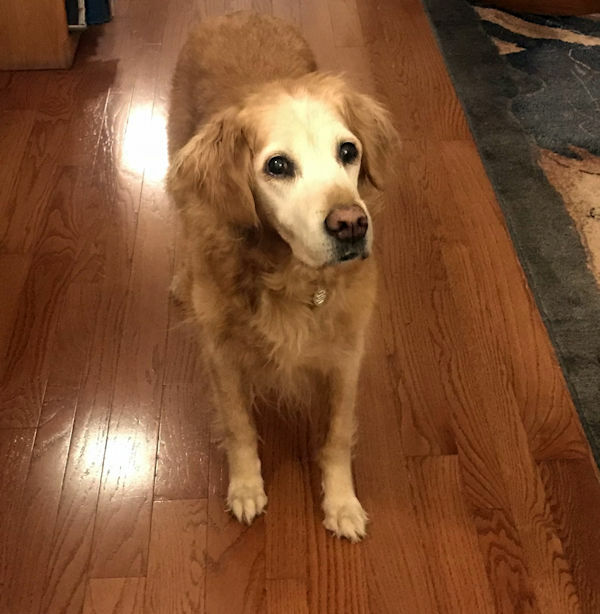 Happily, she recovered -- except for some mild neurological issues, kidney damage, a chronic inflammatory condition and a weakened immune system. She was mostly healthy and happy for the rest of her life, but had to be retired from competition following her illness. She was still passing the CERF eye exams at age 9.5, and her vision and hearing were good to the end! 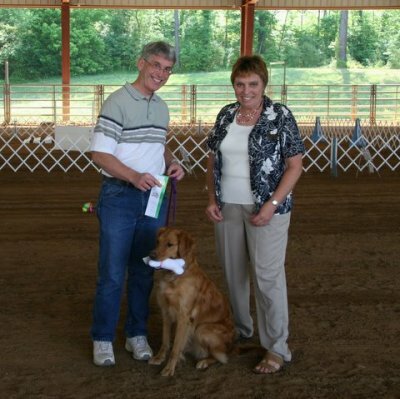 Jim and Penny finished up their Companion Dog Excellent title at the Greeneville, SC trial on February 13, 2009 with a score of 192 for 5th place. What a Valentine's day present! 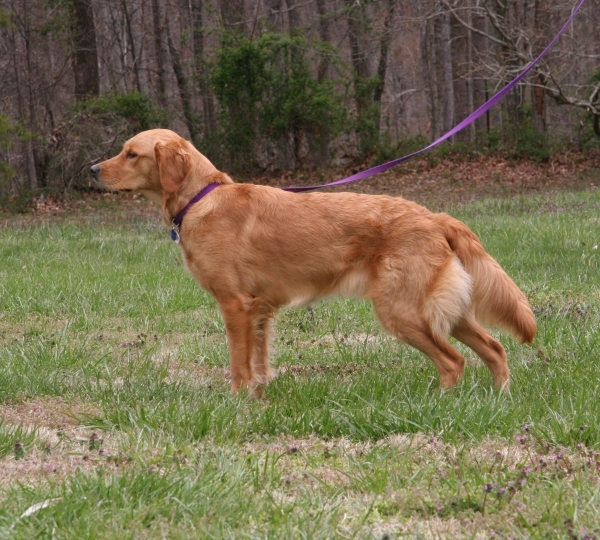 Penny's 2nd leg was a first place win (and a score of 189) at the Franklin, TN cluster January 22, 2009. 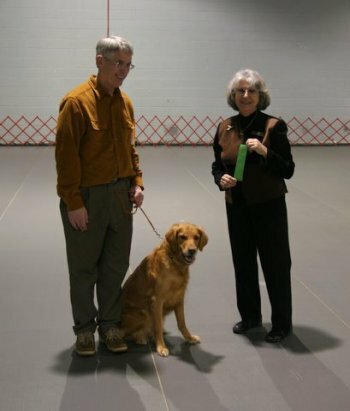 Jim and Penny got their first CDX leg at the Knoxville obedience trial on November 2, 2008. To top it all off, she earned a score of 191 1/2 and a blue ribbon for her effort! 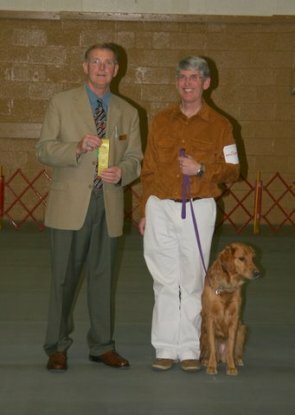 Here is a picture of a happy handler and dog with the judge -- and those ever-important ribbons. One down, two to go! 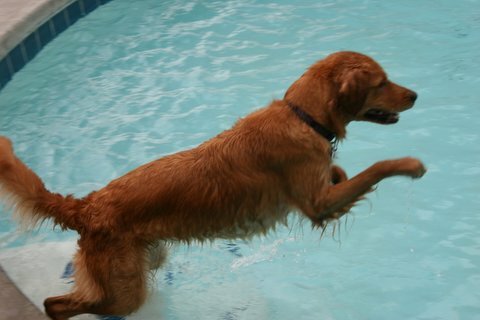 Thanks to our obedience instructor and friend Shannon Shepherd (Leashes by Design) for all the help and for the picture. 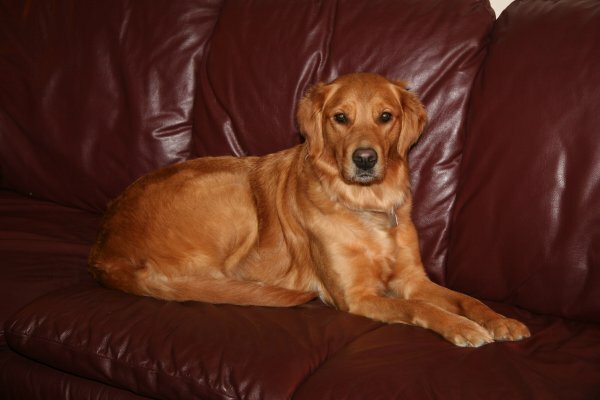 COMPANION DOG PENNY! SHE COMPLETES HER CD TITLE NOVEMBER 3, 2007! 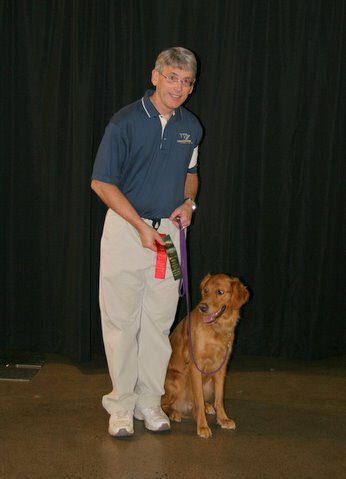 Penny competed in three shows (Knoxville, Chattanooga, and Knoxville) under three different judges, and earned her CD degree with one first place finish, a third, and a 4th. PENNY EARNS HER RALLY EXCELLENT TITLE JULY 15, 2007! 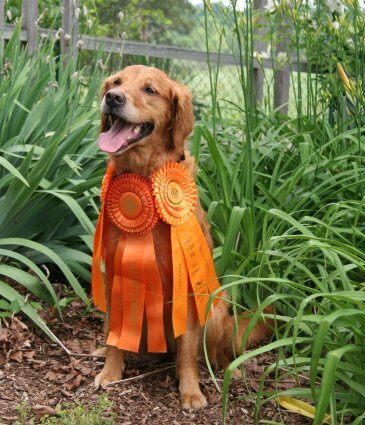 At the Knoxville Cluster Dog Show, Penny completed her Rally Excellent title, with two first places and a 2nd (tied for first on points, placed second on time). She also got her first leg towards her CD title, placing first in her Novice A class. PENNY EARNS HER RALLY ADVANCED TITLE MAY 26, 2007! 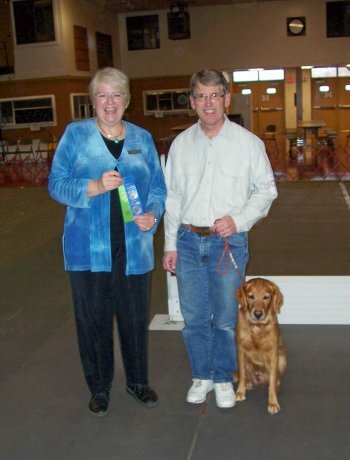 At the Oak Ridge Kennel Club Dog Show on May 26, 2007, Penny completed her final leg for her Rally Advanced title in the minimum 3 shows, with two first places and a fourth. She then came back the next day in Rally Excellent and earned her first leg toward that title with a first place finish. 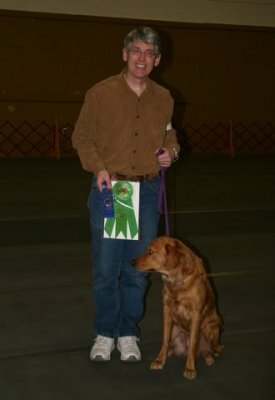 PENNY FINISHES HER AKC RN TITLE NOVEMBER 5, 2006! 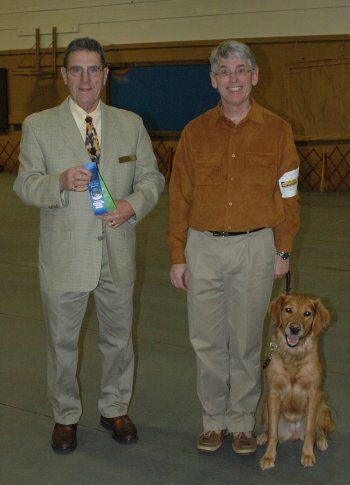 At the Tennessee Vally Kennel Club Obedience Trial on November 5, 2006, Penny qualified for her third leg and placed 1st in her Novice Rally A class. 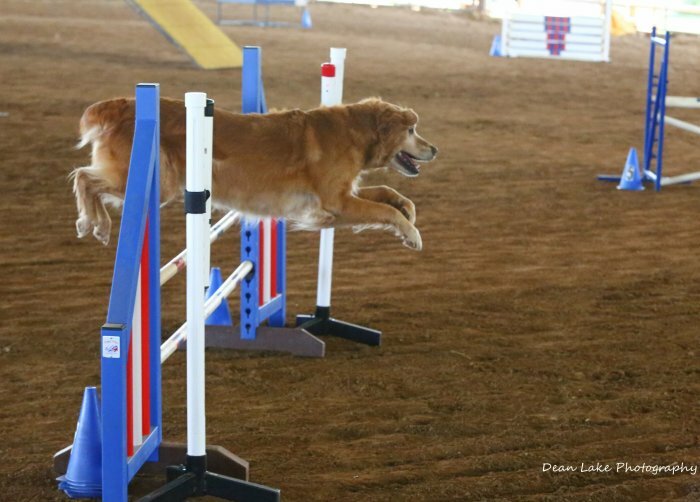 She qualified in the minimum 3 shows, with increasingly better performances each time. She qualified but didn't place in her first class, placed fourth in her second leg, and finished up on a high note with a blue ribbon. We are very proud of this girl, who isn't quite 18 months old yet! Same competition, April 7, 2013. We are showing Preferred since Penny is nearly 8 years old. 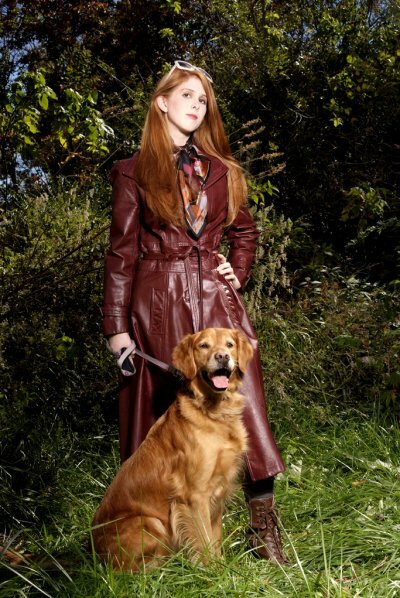 Penny posing with our daughter McKenzie -- October 2010. Photo courtesy Barry Brown Images. 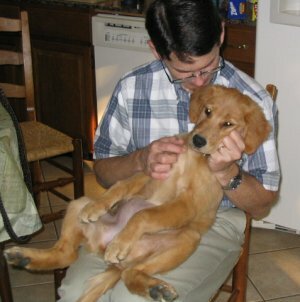 Still a lap puppy -- barely! 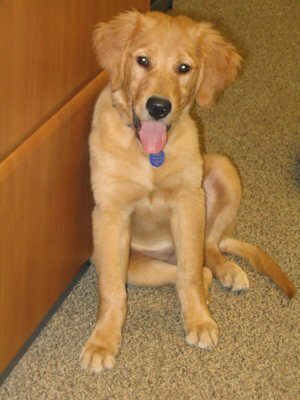 At the end of September 2005, Penny is 4 months old and weighs about 30 pounds. 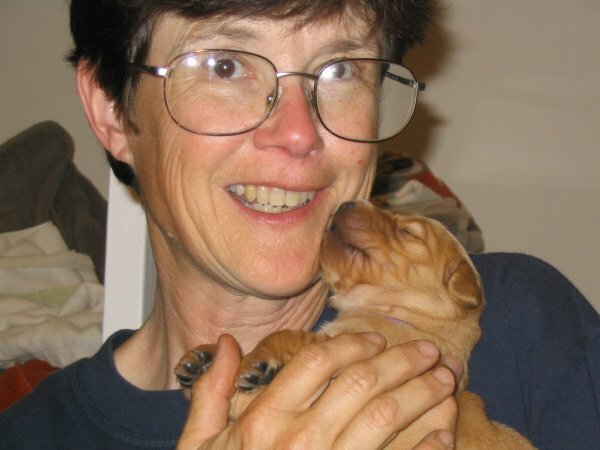 She is getting her permanent teeth (we won't miss the little puppy needles! 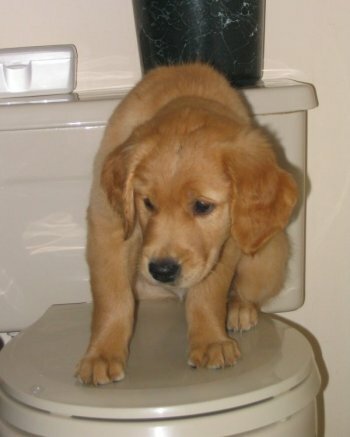 ), is housebroken, and is very charming and outgoing. 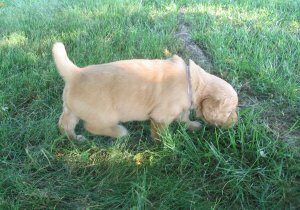 She is a terrific grass ripper, grabbing huge mouthfuls and tossing them up in the air, then going back for more. In addition, she loves chewing -- rawhide bones, books, papers, socks .... whatever fits in her mouth. She is taking puppy class, where she is the most outgoing puppy, and is learning basic obedience commands such as sit, stay, come, and down. 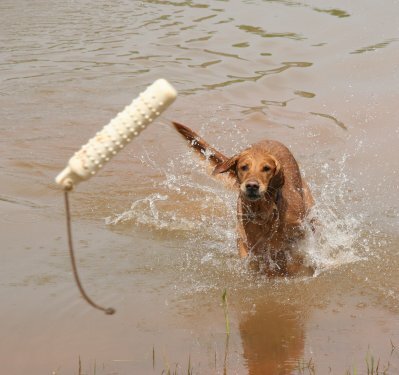 They're all very easy to learn, and she's happy to do them unless something more interesting presents itself....! The world is her oyster, people are divine, her mother is her best friend, and life is wonderful.